Pucker up, sweetie: August 20 is National Lemonade Day! It’s also National Chocolate Pecan Pie Day, but boy, are we all pied out. And there are still more to come. (Incidentally, if that seems like an unusual pie flavor to you, we thought so, too. A little over a week ago we were at the Bite of Oregon festival in Portland, and stumbled upon a chocolate pecan pie that we ended up trying, without even being aware that this holiday was coming up. It was very good). I’ve always had a soft spot for lemonade. I think this is because I’m not a big fan of soda, rarely drinking it (and when I do, it often contains alcohol). Lemonade is a tasty, refreshing alternative, especially on warm summer afternoons. Lemonade is a sweetened beverage made with lemons, sugar, and water. It dates back to at least the 10th century, when Egyptians were making quite a profit selling the juice from lemons, which flourished in the region. Locals enjoyed the beverage mixed with lots of sugar. We know this thanks to Nasir-i-Khusraw, a Persian poet and traveler who wrote an extensive treatise on life in Egypt during this time. A typical excerpt read, “Woke up. Worshipped a cat. Drank lots of lemonade. Dinner with daddy and mummy. Bed time.” When told that too much of the sweetened concoction could cause tooth decay, Egyptians said, “no – you’re wrong.” Those folks were in de-Nile. (Longest set-up to a punch line ever). Actually, drinking lemonade can be healthy. Studies show that consuming 4 oz. of lemon juice mixed with two liters of water every day can help prevent kidney stones. On the downside, this may put you in a sour mood. I’m here all week, folks. Juice the lemons with a juicer or by hand. Rolling them on the counter with moderate pressure prior to juicing will result in more juice from each lemon. Try to keep out the seeds. 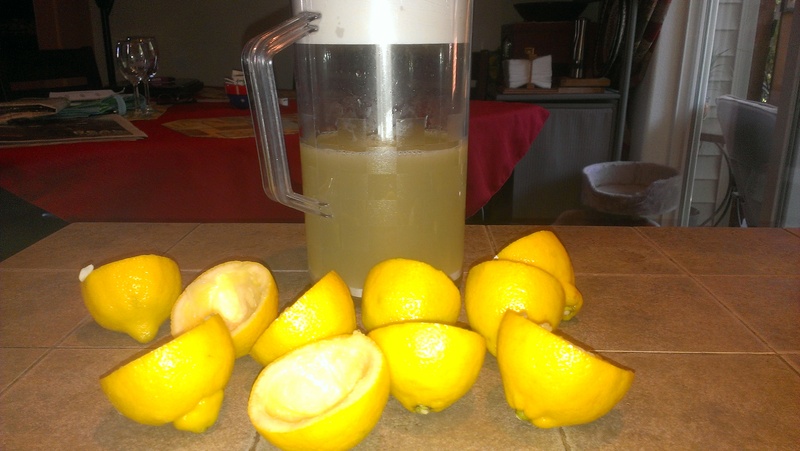 If you prefer lemonade with no pulp, strain the juice to remove it. Dissolve the sugar in the water (heat may be helpful). Combine the juice with the sugar water in a pitcher and stir well. Chill or serve over ice cubes. I’m happy to report, this seems to be the perfect ratio; Tara and I met up at home for lunch, and enjoyed some fresh lemonade. It was about a thousand times better than concentrate, too! If you like piña coladas and getting caught in the rain, then put away your umbrella and “escape” to the tropics to enjoy today’s food holiday. July 10 is National Piña Colada Day! It’s also National Pick Blueberries Day, but we’re working. Ain’t nobody got time for that! Besides, we’ll pay homage to blueberries tomorrow. Before I continue, let’s go ahead and get this over with. If you’re like me, whenever you think of piña coladas, you end up with this Rupert Holmes song stuck in your head. 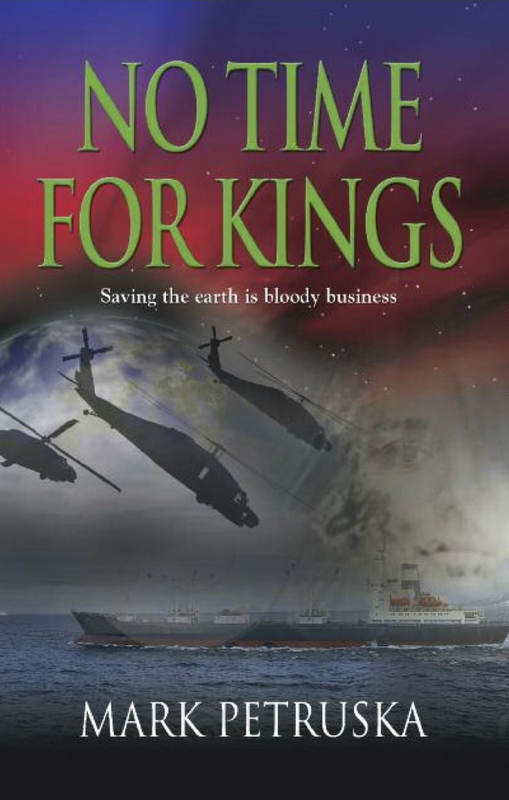 So go ahead and indulge while reading on. If you’re interested in a post where I dissect this song and offer some interesting information about it, feel free to check out my personal blog. The piña colada (gotta get that squiggly line in there to make it official) is a tasty blend of rum, pineapple juice, and cream of coconut. It’s also the national drink of Puerto Rico. It’s name means “strained pineapple” and, while the first reference to mixing fresh pineapple juice with rum dates back to 1922, the drink itself wasn’t invented until 1952-ish. I say “ish” because, like many of the drinks we’ve celebrated this year, multiple people claim to have invented it. Depending on whom you believe, credit goes to either Ramón ‘Monchito’ Marrero Pérez at the Caribe Hilton Hotel’s Beachcomber Bar in San Juan, Puerto Rico on August 15, 1952. Ricardo Garcia, who worked at the same bar, says HE invented the drink. And Ramón Portas Mingot says sorry lads, I am the one who came up with the drink at the Barrachina Restaurant in San Juan in 1963. To this day, the restaurant backs up Mingot’s claim. While those guys are busy duking it out over ownership rights, I’m content to settle back and whip up a fresh and tasty piña colada. 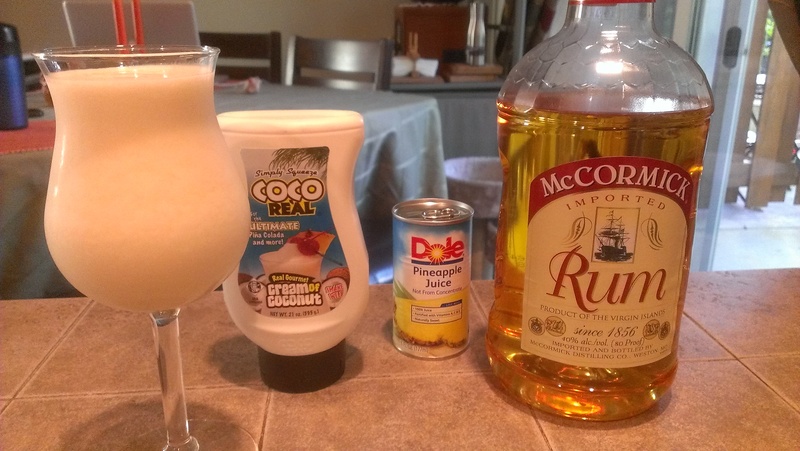 They’re easy to make: just use equal parts rum, pineapple juice, and cream of coconut (we had no problem finding this in the mixed drink section of the grocery store). Blend with ice, add a tiny folding umbrella if you’ve got one, and sip away. You’ll be transported to paradise! Tea-totallers of the world unite: the 10th of June pays homage to a refreshing beverage that can be either sweet or tart. It’s National Iced Tea Day! It is also Herbs & Spices Day and Black Cow Day. Technically we also celebrated the former since we cooked dinner using herbs and spices, but that’s hardly unusual. And with so many desserts in the month of June, the Black Cow just didn’t moo-ve us. So, iced tea it was! Iced tea was originally made with green tea, but over the years black tea became the preferred choice thanks to inexpensive imports from India, Ceylon, South America, and Africa. Iced tea is most commonly served with a slice of lemon as garnish, and is often sweetened with sugar. In the South, “sweet tea” (a very strong brew with lots of sugar) is especially popular, helping Southerners deal with the heat and humidity. Bottled iced teas are available across the country, manufactured by brands such as Snapple, Lipton, and Nestea. In recent years, the Arnold Palmer (aka “Half and Half”) – a mixture of 1/2 iced tea and 1/2 lemonade, named after the legendary golfer who liked to combine the two at home – has become increasingly popular. Iced tea is one of my favorite beverages, and I’m not alone: 85% of the tea consumed in America is iced. I’m not a big soda drinker, so 9 times out of 10 when I’m eating out I’ll order iced tea (assuming that alcohol is not in the mix, of course). 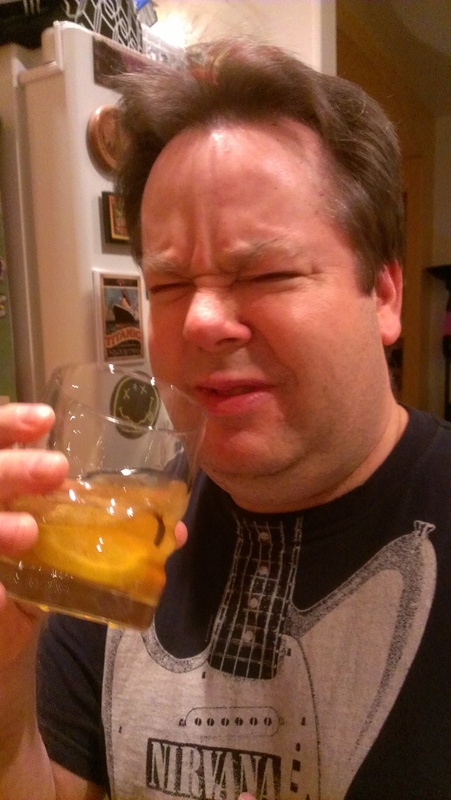 (And sometimes when it is in the mix: vodka and iced tea ala Jeremiah Weed is a pretty tasty drink). So, I was more than happy to indulge! 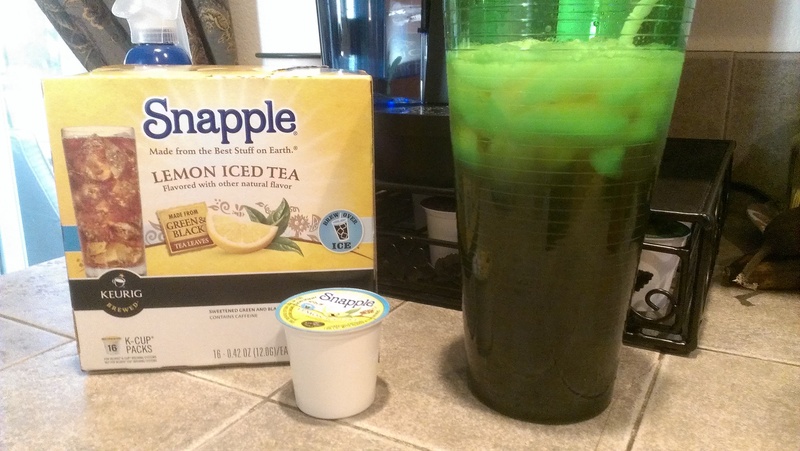 Tara and I love our Keurig coffeemaker, and have recently discovered Snapple Iced Tea k-cups. They come in both lemon and peach flavors, and each is delicious. We brewed some up tonight to go along with our dinner! 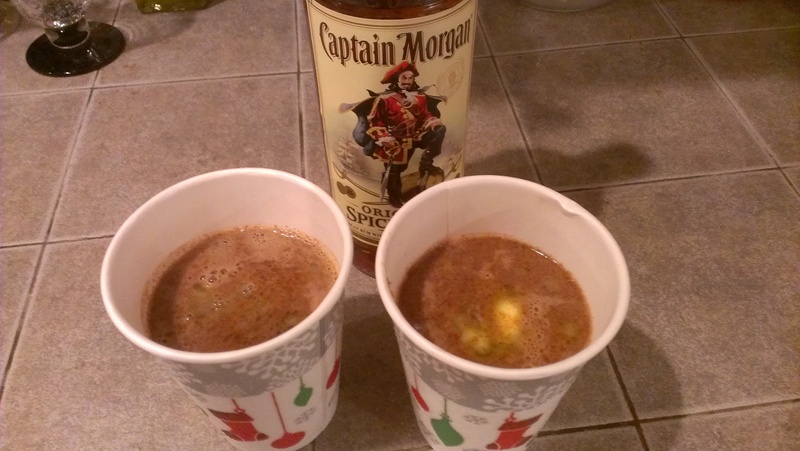 Jack Sparrow would approve of today’s holiday: January 17th is National Hot Buttered Rum Day. Of all the various liquors, I think rum has the best flavor, so even though we recently celebrated a hot alcoholic beverage and didn’t care for it, I had high hopes for this drink. In fact, hot buttered rum is closely related to the hot toddy. Both drinks are popular in the winter months (duh). But where the hot toddy is traditionally made with whiskey and honey, hot buttered rum is made with rum and butter (duh again). Plus brown sugar and spices like cinnamon, cloves, and nutmeg. The drink was a big hit in Colonial America, and was created in the 1650s after colonists began importing molasses from Jamaica. They quickly learned this byproduct of sugarcane could be turned into rum, and a series of distilleries opened up across New England. (Similar attempts to turn maple syrup into bourbon, honey into wine, and the tears of Pocahontas into absinthe failed miserably). Soon they were adding rum to everything, including toddies and eggnogs. In a mixing bowl, combine all ingredients thoroughly. Refrigerate in a sealed air-tight container for up to two months. This mixture can also be frozen for up to one year before using. Makes eight servings. In a hot beverage mug, combine hot buttered rum batter with boiling water, stirring well until dissolved. Add in rum and cream, if using. Garnish with a sprinkle of nutmeg. Serves one. Remember how we didn’t like those hot toddies? 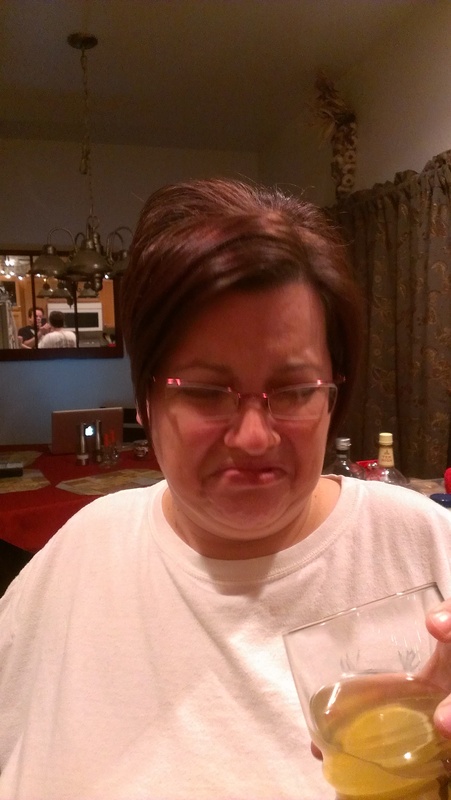 Well, the hot buttered rum was…drumroll, please…DELICIOUS! Really, really good stuff. We were both impressed. I think we’ll have to make these an annual holiday tradition! Hot buttered awesomeness is more like it!